There are a lot of wedding venues in the greater Washington, DC metro area at which we love to photograph couples getting married, but there are very few that we have enjoyed as much as the Salamander Resort & Spa in Middleburg, Virginia. How much did we like taking wedding photos at this luxury resort? So much that we have gone back and stayed there ourselves on a couple of occasions! Located a little more than an hour from downtown Washington in the foothills of the Blue Ridge Mountains, the Salamander Resort & Spa is a fantastic destination for fiancés looking to have an elegant and luxurious marriage celebration surrounded by the rustic beauty of rural Northern Virginia. For brides and grooms looking to be pampered a bit, the resort offers its wedding clients a 23,000-square-foot spa, 14 different treatment rooms and a heated outdoor pool. For couples who prefer a more outdoorsy experience, every one of the Salamander’s 168 guest rooms and suites has a beautiful view of the surrounding hills and forests. The resort’s first-class staff will literally design your wedding to fit exactly what you’re looking for. Do you want a riding and equestrian-themed matrimonial event? They can do that. Does your vision include traditional Southern elegance? That’s no problem for them either. Would you like to get married in a more vineyard-like setting? They will arrange it for you. The Salamander Resort & Spa also offers a wealth of activities that can be incorporated into the wedding weekend festivities or offered as possible entertainment options for wedding guests in from out of town. The resort contributes to the Middleburg area’s strong equestrian tradition with a 14,000-square-foot stable and 25 acres of riding space. For folks who like the aforementioned wine-tasting, there are a number of vineyards not far from the Salamander where wedding parties or other guests can sample the best vintages that Virginia has to offer. We’ve done a few Northern Virginia wine tours ourselves (including one during a stay at the Salamander), and we can’t recommend them highly enough. Golfers will also not be disappointed with the options nearby, as we again know from firsthand experience. Throw in extensive hiking trails and a zip line on the hotel’s property, and you have enough to keep your wedding guests entertained for weeks! One of the things that we particularly like about the Salamander Resort & Spa as a wedding venue, though, is the venue’s opulent library. Filled with heavy, dark wood furniture (which we are suckers for! 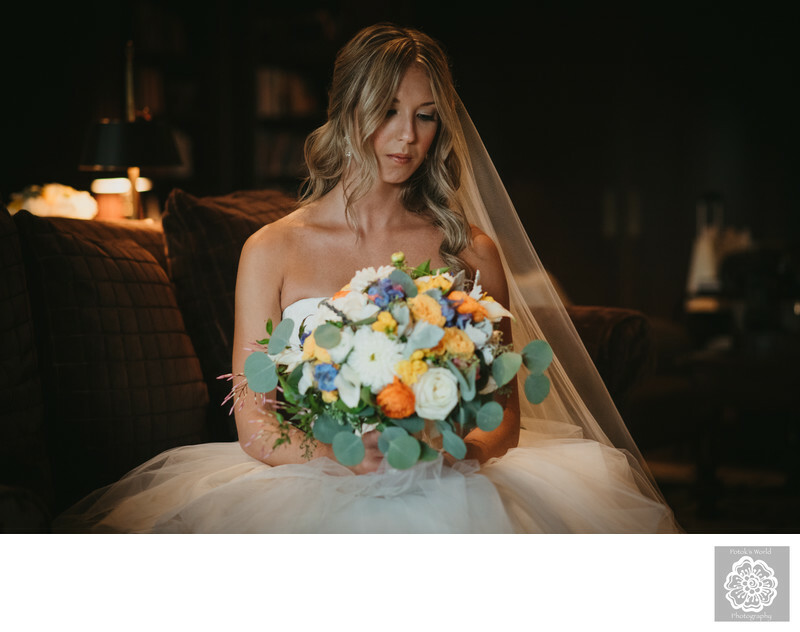 ), the room soaks up sound, making it a perfect spot to bring brides and grooms for peaceful, reflective and contemplative individual portraits before the marriage ceremony. We love being able to get photographs of people who are soon to be wed looking like the bride-to-be in this shot. We feel that the serenity in an image like this contrasts beautifully with the often raw emotions evident in the pictures of the ceremony and the obvious whirl of movement in the photos of the reception. And we have not found too many venues better for helping brides and grooms find that inner peace and tranquility than the Salamander’s luxurious library. Location: Salamander Resort & Spa, 500 N Pendleton St, Middleburg, VA 20117.